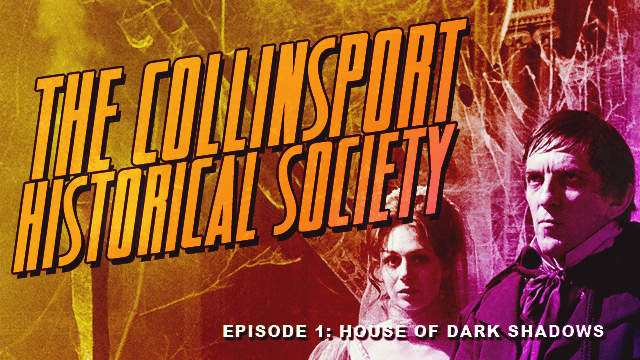 The Collinsport Historical Society kicks off its first podcast with a look back at HOUSE OF DARK SHADOWS. Kathryn Leigh Scott stops by to talk about her role in the film, while host Wallace McBride, Will McKinley, Jessica Dwyer and I talk about plagiarism, Barnabas Collins’s recipe for banana bread, and why Willie Loomis is the film’s real hero. Featuring the songs “Barnabus Collins: Love Bandit” by Keanya Collins, “The Ballad of Barnabas Collins” by the Von Hoffman Orchestra and “Barnabas Collins” by The Lone Ranger. You can download the entire podcast as an MP3 by clicking HERE. KATHRYN LEIGH SCOTT landed the ingénue lead in the classic Gothic daytime drama Dark Shadows in 1966, and starred in the 1971 MGM feature, House of Dark Shadows. Kathryn played four roles in the series: Maggie Evans, Josette du Pres, Lady Kitty Hampshire and Rachel Drummond. Realizing that the enduring and innovative series still has a tremendous following in syndicated reruns throughout the world, Kathryn wrote Dark Shadows Memories to coincide with its 20th anniversary and Dark Shadows Companion as a 25th anniversary tribute. Kathryn’s theatrical credits include a lengthy run with James Stewart in Harvey in London’s West End. TV audiences have seen her in the four-hour mini-series Voice of the Heart, based on the Barbara Taylor Bradford novel, as Dan Travanti’s wife in Murrow, George C. Scott’s mistress in The Last Days of Patton and Philip Marlowe’s girlfriend in Chandlertown. Feature films include Providence, The Great Gatsby, Brannigan, The Greek Tycoon, Assassination, 187 and Parasomnia. WILL McKINLEY is a long-time DARK SHADOWS fan and classic film blogger. You can find him atCINEMATICALLY INSANE. JESSICA DWYER started the Fangirling at a young age. Baptized in many a genre by a sister who had tons of Vampirellas sitting about as well as local Creature Feature every Friday night on PBS, Jessica didn’t stand a chance of turning out normal. Jessica started Fangirl Magazine to celebrate the female fans of the world and the things that they love. It’s not just the Fanboys out there, and the gals should have a chance to be heard.